The Guiding Excenter is an accessory for astrophotography (and prominence-viewers): You may search for guiding start across a field of 45mm diameter. If you´re working with a separate guiding-scope, you will know the vexing problem of differential flexure between the imaging- and the guiding-scope: Elongated stars even if the guiding was perfect. The source of this problem are usually the unstable, adjustable Guidescope Rings. With the Guiding Excenter this problem is fixed: Use sturdy and rigid scope rings instead of the variable ones to mount your guiding scope. To search for guide stars, you only move the (leightweight!) reticle eyepiece or autoguider in the focal plane of the guide tube. TheGuiding Excenter offers the possibility of a search field with almost 2 "in diameter for suitable guide stars. The Guiding Excenter is made entirely from black anodized aluminum. All screws are stainless steel, the heads of the thumb screws are made of plastic. On the eyepiece-side, the Guiding Excenter has a sleeve for 1.25 "eyepieces. If this is removed, there is a female M36.4x1 thread (Vixen-standard thread). For this thread an adapter to male t-thread thread is available. With this adapter you may mount your autoguider or similar accessories directly to the eccentric without a wobbly push-fit connection. The sliding-piece runs on Teflon slides, the rotation-part attaches securely with a dovetail, without any tilting or twisting. The Guiding Excenter has an optical path length of 43mm or 15mm and weighs 156g. Especially when working with video cameras and huge focal lengths, as used for high-resolution imaging of planets, moon or sun, the Double Slider makes your work easier: Locate and center the desired object on one side in the eyepiece, then switch over to webcam or autoguider by moving the silder. Now you may use the large field of view of an eyepiece to locate and focus your object and then move quickly and without aany hassle to the webcam/guider. The double slider is also entirely made of black anodized aluminum. All screws are stainless steel, the heads of the thumb screws are made of plastic. Telescope-side of the Double Slider has a female T-thread. Matching adapters to 2" are available. 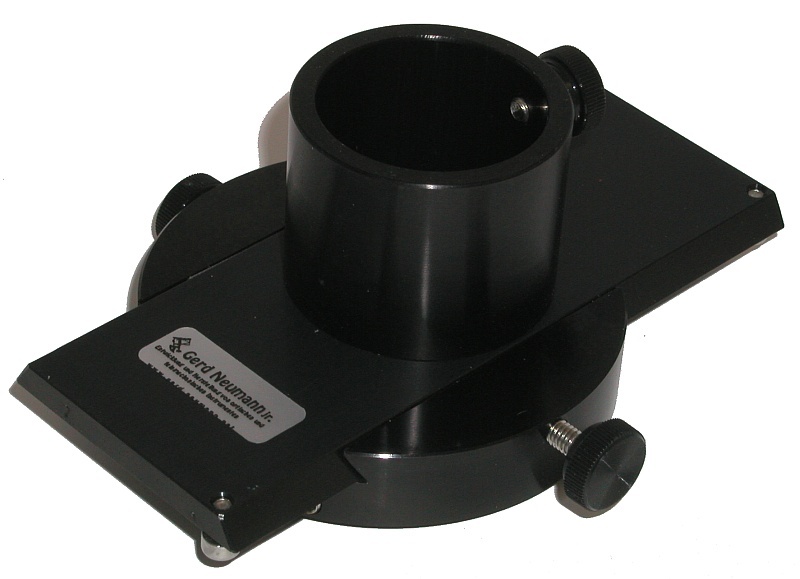 The Double Slider has two sleeves for 1.25" eyepieces or an autoguider / a webcam. If the sleeve is removed, there is a female M36. 4x1 thread (Vixen-standard thread). For this thread an adapter to male T-thread is available. You may mount any accessories with T2 thread directly to the eccentric. The sliding-piece of the double sliders also runs on Teflon slides, the dovetail attaches securely and without twisting or turning. The double slider has an optical path length of 43mm or 15mm and weighs 174g.